When reading headlines about the property market, you’ll usually find them targeting a region or city rather than considering the merits of one suburb to the next, or even one property to the next, which is how the Blue Wealth Property research model is structured. In our micro research two integral parts are ‘Design’ and ‘Amenity’, but if you find the best growth areas do these elements really matter? The answer is undoubtedly yes. Inferior design can be detrimental to you as an investor in a number of ways including vacancy, one of the biggest risks you are exposed to as a consequence of owning a poorly designed property. Projects/dwellings that don’t fit the area demographic are always going to be harder to rent and sell, affecting your cash flow and feasibility in the long run. A perfect example of this can be seen in Melbourne’s inner ring, one of Australia’s most rapidly appreciating markets. The following graph depicts the vacancy rate of Abbotsford and Docklands, two suburbs both 3 kilometres from the Melbourne CBD and both representative of a similar young professional demographic. 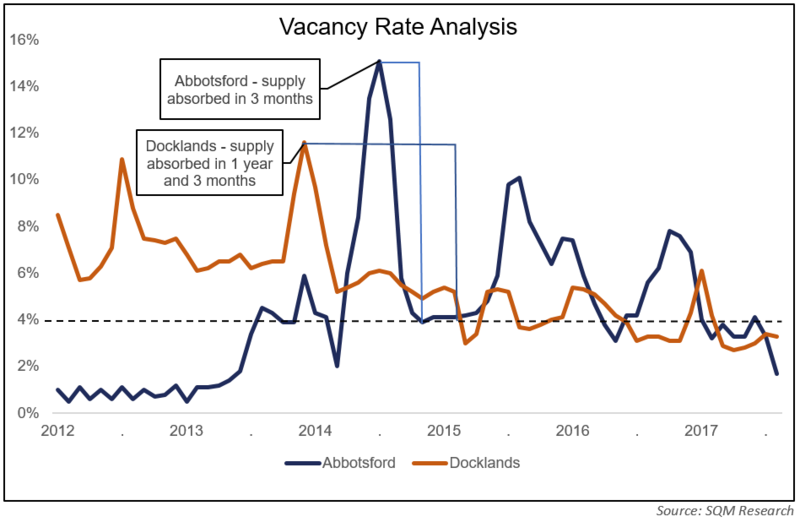 If you look at the vacancy spikes throughout the graph you will see that Abbotsford reflects a market that absorbs new supply much more quickly than does Docklands. Both experienced a large spike in excess of 11% in 2014, however, the Dockland’s market took an extra year to absorb most of the new supply. To counter this slowly reactive market, an investor within Docklands over the twelve month period would have two unattractive options: lower the rent to attract a tenant, or wait for an extended period of time for a willing tenant to appear. As both of these markets are located within the same proximity of the city, why do they vary so much? The answer lies within the amenities of each suburb and the properties themselves. Abbotsford’s excellent local acceptance of the new supply was based on quality, with lifestyle amenities and design in many of the Abbotsford dwellings being put ahead of the number of dwellings constructed. On the other hand, the Docklands market took on a large influx of high density projects with less amenities, and the resultant lower quality made for disgruntled investors struggling to find tenants. Between the 2011 and 2016 censuses Abbotsford experienced a 268% increase in the number of apartments in the local market. As a result, the area has evolved to accommodate a new demographic that commonly follows the ripple effect of gentrification. Yes, that’s right I am talking about the young workforce category! In just 5 years the local population added 3,200 residents and the median age dropped by 3 years. Young professionals have increasingly dominated the area, as the demand for quality high density apartments is continually met. With the young rent driven workforce unceasingly moving in to make it their own, the face of Abbotsford has changed with regard to culture and commerce. If you are going to take anything from this, it should be that in choosing your investment you must search deeper than just a city or a region. Even though properties and suburbs lie only kilometres apart, ultimately their performance can deviate significantly. Is the Sydney Housing Premium About to Disappear?